Parallel stories set in different times, one told in prose and one in pictures, converge as a girl unravels the mystery of the abandoned Thornhill Institute next door. 1982: Mary is a lonely orphan at the Thornhill Institute For Children at the very moment that it's shutting its doors. When her few friends are all adopted or re-homed and she's left to face a volatile bully alone, her revenge will have a lasting effect on the bully, on Mary, and on Thornhill itself. 2017: Ella has just moved to a new town where she knows no one. 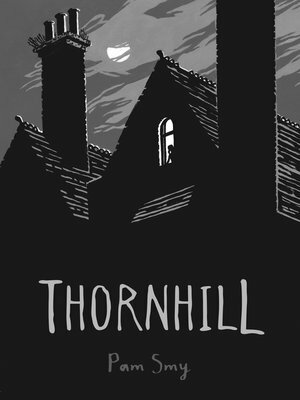 From her room on the top floor of her new home, she has a perfect view of the dilapidated, abandoned Thornhill Institute across the way, where she glimpses a girl in the window. Determined to befriend the girl and solidify the link between them, Ella resolves to unravel Thornhill's shadowy past. Told in alternating, interwoven plotlines—Mary's through intimate diary entries and Ella's in bold, striking art—Pam Smy's Thornhill is a haunting exploration of human connection, filled with suspense.